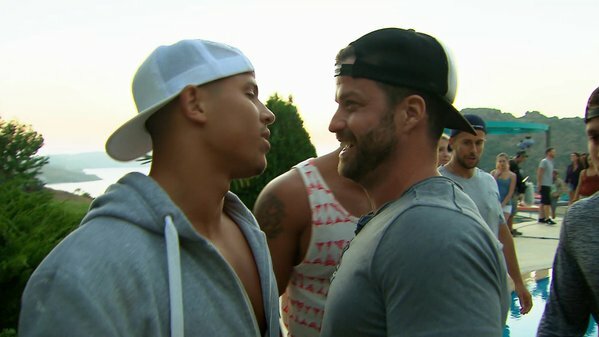 Apparently, last night, while I was having a ball at the Jazmine Sullivan concert, MTV aired TWO new episodes back-to-back of The Challenge: Battle of the Bloodlines. So I'm playing major catch up right now. I'll be posting the other episode in another post, so this one won't be crazy long. Picking up from last week, after the Red team's win in trivia, everyone heads off to deliberate who will be heading into The Pit. The vets plan to divide the male rookies, knowing that they're gunning for the vets. In a stupid move, Mike (Abram's brother) volunteers himself, but the Blue Team doesn't go along with his plan. Why would you even do that when you JUST got there? Why risk it?! Nany convinces several Blue Team members to throw in Raphy to break up the rookie alliance, and Johnny tries to get the Red Team to vote for Mitch. Perfect idea. At nominations, the majority of the Blue Team does indeed vote for Raphy, even Aneesa, which pisses Cory off. He figured he could give her a little attention, and she would just go along with everything he said. What does he expect after the way he treated her? As the red team begins voting, Raphy and Dario lash out, with Dario eventually throwing low blows at Nany and Nicole. Nany tells this rookie repeatedly,"Know your role." to which he responds "The only role you know is on Johnny's lap." Disrespectful! The majority of the Red Team does indeed end up voting for Mitch, and the rookies are seriously mad now! Later, Johnny, Dario, Raphy, and Nany all get into a major argument about all this! Honestly, I really want Dario and Raphy to go home. I don't know them, and don't care to know them. They're annoying. That night, as they go out, you can see that the house is clearly divided, with the rookies on one side of the bar and the vets on the other. Nany and Aneesa plan to get KellyAnne eliminated so they can make it to the final. They think she's just flirting with the rookies to get a free pass through the challenge! After seeing Aneesa glaring at her for a while, KellyAnne gets into it with her and KellyAnne get into it, with Aneesa throwing a drink in her face! They walk a way for a bit, but eventually get into it again. When Aneesa criticizes KellyAnne's looks, KellyAnne talks about Aneesa's "black skin," even touching her face! Aneesa pushes her, calling her a "racist anorexic." HOW DARE YOU KELLYANNE! Back at the house, even the rookies call her out for her comment! She's definitely not living that down. Shameful. At The Pit, T.J. announces that Raphy and Mitch will be playing "My Way or the Highway," with the first contestant to pull an opponent's chain past their mark wins. Basically a huge game of tug of war but with chains attached to each guy's chest. It's definitely very physical and challenging. Raphy seems like he has it at first, but is using mostly his arms instead of his entire weight, which people pick up on. Mitch struggles, and even falls in the middle of the challenge himself though, causing Dario to think his brother won. He goes to celebrate with him, but the challenge wasn't over, dummy! 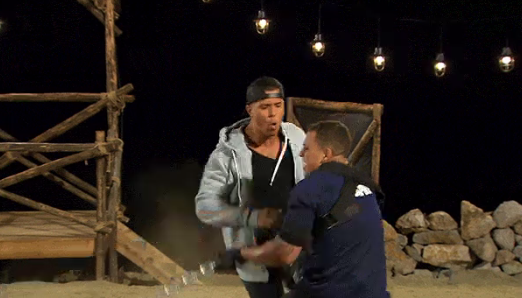 That moment of distraction allowed Mitch to pull Raphy's chain and win the elimination, sending Dario and Raphy home. Pride goes before a fall, guys. Good riddance!